Photo courtesy Washington Department of Fish and Wildlife. This photo is available for media use. Despite a struggling population, fishers are still legally trapped in Montana, and as trapping for wolves, bobcats and other species has been on the rise in Idaho and Montana, so have levels of “incidental” trapping of fishers. Twice as many fishers have been incidentally trapped in Idaho since 2008 as were captured from 2002 to 2007. 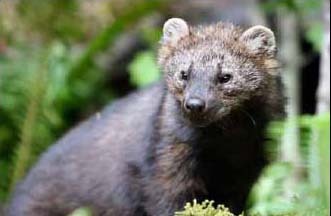 Reported nontarget catch of fishers by individual fur-takers in Idaho from the 2010-2011 season through the 2013-2014 season have totaled 142, 63 of which have been killed. It is unknown how many fishers are incidentally trapped and killed in Montana each year because the state does not maintain records of nontarget catch. Defenders of Wildlife is a national non-profit conservation organization founded in 1947 focused on conserving and restoring native species and the habitat upon which they depend, and with more than 1,200,000 members and supporters nationwide including more than 5,000 in Montana. Friends of the Bitterroot is a nonprofit organization with over 350 members dedicated to forest protection and conservation of native wildlife species in the Bitterroot valley and surrounding National Forests. Friends of the Wild Swan is a Montana nonprofit conservation group that protects water quality, fish and wildlife in northwest Montana.